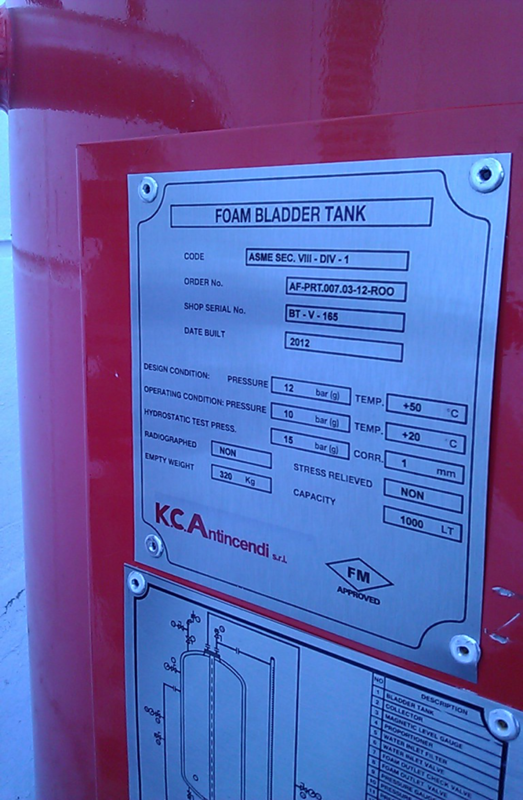 FM Approvals has been made aware of a foam extinguishing system bladder tank that was not made by the FM Approved manufacturer K.C. Antincendi of Bressana Bottarone, Italy. 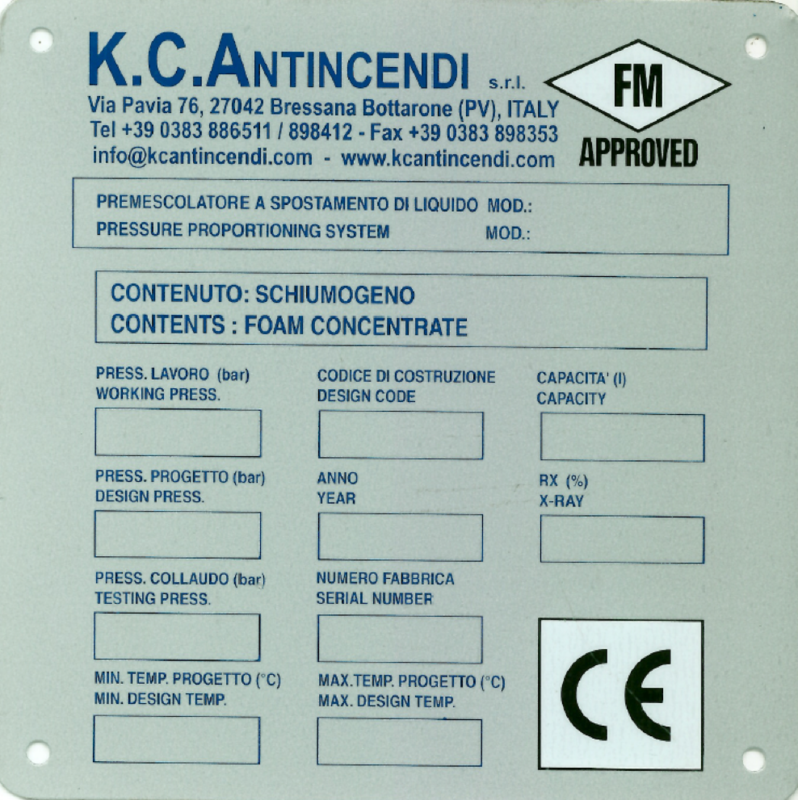 The counterfeit tank in question bore the FM Approved manufacturer’s company identity (K. C. Antincendi) as well as the FM Approvals certification mark (see Fig. 1). K.C. Antincendi is a fully owned subsidiary of Minimax Viking GmbH. A third party installing company in Turkey was suspect of the counterfeit tank citing several poor quality features and contacted K. C. Antincendi. The K. C. Antincendi representative visited the site and confirmed the tank was not their product and that it was a fraudulent representation of their product, company nameplate and the FM Approvals’ certification mark.  K. C. Antincendi maintains FM Approval on their actual product. The bladder tank identified in this Product Alert was never tested or certified by FM Approvals and has been deemed by K. C. Antincendi as not representative of their FM Approved product. Since there is no evidence these counterfeit products have ever been tested to the rigorous requirements of any testing and certification organization, including FM Approvals, we believe that use of these products may present a serious property loss concern for the user. The tank was never installed at the FM Global insured site in Cerkeskoy, Turkey and was returned to ODES. It was noted in correspondence from K. C. Antincendi that ODES may still be trying to sell and install the counterfeit tank in the Turkey market. Contact Details of the FM Approved Manufacturer. Figure 1. This photo of the counterfeit tank was taken by the third party installing firm at the location to which the counterfeit tank was shipped. Distinguishing characteristics of the counterfeit product include the incorrect font that appears in the K. C. Antincendi logo. Figure 2. Above is the representation of an authentic K. C. Antincendi certification label depicting the actual font used by K. C. Antincendi.